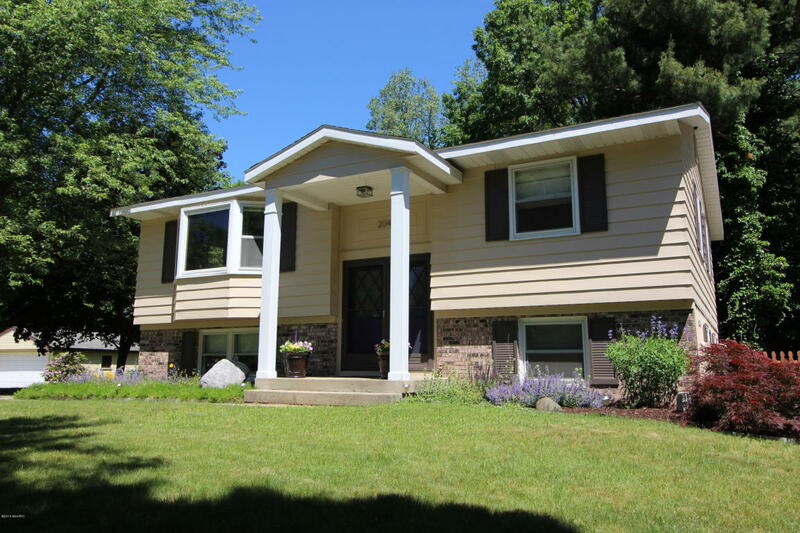 Just minutes to Knapps corner or Downtown GR, this conveniently located 4 bedroom, 1 1/2 bath split level home also offers seclusion and privacy in Beckwith Hills. A huge, fenced back yard and 3 living spaces there is plenty of room to stretch out. Beautiful Kempis wood floors run throughout the main level. The living room features a bay window while the vaulted ceiling family room at the rear of the home features a skylight, built ins, a wood burning stove, and sliders to the deck which overlooks a huge fenced in back yard. A beautiful maple kitchen with a stunning tile backsplash and stainless steel appliances separates the two main floor living spaces. 2 bedrooms & a full bath round out the main floor. The daylight lower level, with bamboo flooring throughout, offers 2 additional bedrooms(the 4th is currently used as a billiards room), another living space, a half bath and laundry area. There is also an additional storage space that could be finished into a fifth bedroom, or left as storage/work space. Additional features include a 24×26 2 stall garage, wired for a security system, attic fan, a newer furnace and water heater.